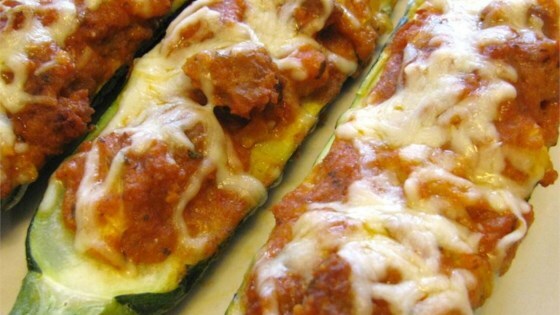 "Fresh out of the oven...zucchini packed full of meat, sauce and cheese makes a delicious dish!" Cook and stir the ground beef in a skillet over medium heat until the meat is browned, breaking the beef up into crumbles as it cooks, about 10 minutes. Drain off excess fat, and transfer the beef into a mixing bowl. Slice the zucchini in half the long way, and use a spoon to scoop out the flesh, leaving a 1/2-inch thick shell all around the zucchini. Chop the scooped-out zucchini flesh, and add to mixing bowl. Stir in the bread crumbs, garlic, spaghetti sauce, black olives, and Parmesan cheese; mix the stuffing well. Lightly stuff both halves of the zucchini with the meat mixture. Place the zucchini halves into a baking dish, and cover tightly with foil. Bake in the preheated oven for 45 minutes, remove from oven, and remove the foil. Sprinkle 1/2 cup of shredded mozzarella cheese over each zucchini half. Move an oven rack to within 6 inches of the oven broiler's heat source, turn on the broiler, and broil the zucchini until the mozzarella cheese is browned and bubbling, about 5 minutes. Baked zucchini boats are stuffed with seasoned ground beef and Italian sausage. I can't even tell you how good this is!! I followed the directions exactly and I served it with a salad and garlic bread. THIS one is now a permanent part of my go to recipes! I also think the measurements are off. There was enough filling for 5-6 good sized zucchini. My daughter loved these and wants me to make them again.